The 6th National Conference on Geographical Studies was held on Dec. 3 at Palma Hall in the University of the Philippines Diliman. 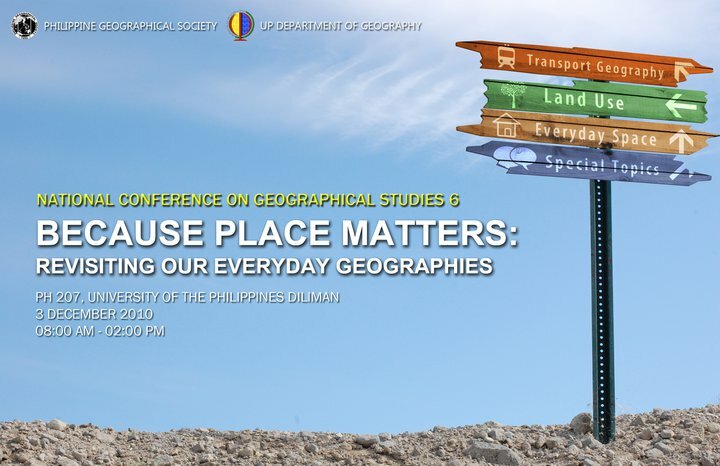 With the theme of “Because Place Matters: Revisiting Our Everyday Geographies,” this year’s NCGS covered studies on transport geography, land use and everyday space, along with special topics not falling into the above categories. These special studies included “Raptor Migration in the Philippines,” by Jonathan Villasper, and “Precincts as Electoral Space: Evaluating the Efficiency of the Clustered Precincts in Barangay Pasong Putik, Novaliches, Quezon City,” by Maria Concepcion F. Garcia.